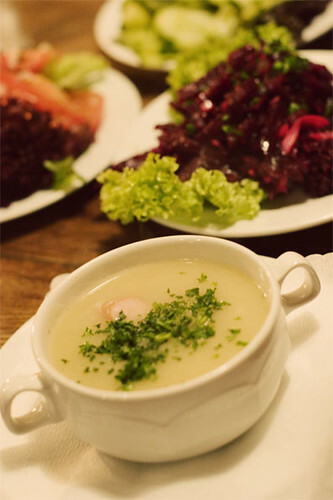 My friend’s friend that lives in Berlin recommended Max and Moritz for a real Deutsch meal. It’s name after a very popular illustrated story that was published in 1865 about Max and Moritz playing pranks on people. So how good is a restaurant that named itself after two pranksters? Well…..
After what seem like forever walking around Kreuzberg trying to find this place because T’s friend gave her the wrong address it didn’t matter where we ate anymore but we pushed on. After a good 30mins of wandering around we finally found the damn place. Once I walked in I felt like I was transported to another place. Kreuzberg was quite a trendy hood but Max and Moritz felt more like a homey sort of place. Wooden floors, a grand wooden bar, tall ceilings, warm, people sitting around enjoying the atmosphere, food and each other. We were told that our table will be ready in 15mins or so so we grabbed a drink at the bar. While at the bar we were flipping through the menu. Each page contained illustrations from the original story, it was like I was flipping through the story but with descriptions of their entrees and soups. Finally we got a table. We were seated in the middle of the room which I was able to see the front and the back of the place. This place definitely was made to accommodate big groups because well there were loads of big groups in the restaurant. But after more than 30mins none of the waitress came by to take our order while most of the people around us were enjoying their food. Everything looked so good. A plate of meatballs strolled by me and I was like….oh gawd! FINALLY after another 10mins (I know we should’ve done this waaaay earlier) we got a waitress to stop to take our orders but just went we were about to say something she was stopped by another waitress. APPARENTLY the kitchen had said to not take any orders yet because they’re backed up. HUH? WHAT?!?! WAAAAAAYYYYYY THE….HUH?! That’s not normal. It’s the first time I heard such things! AAAARRRGGGGHHHHHHHH it was freakin 10pm or something. I was tired and not hungry anymore. BUT! My friends and I decided to stay. After 10mins or so the waitress that showed us to our table took our orders. They could’ve served us these bread while we were waiting for them to take our orders. I just don’t get it but after taking a bite of the bread I quickly forgot all the bad things. 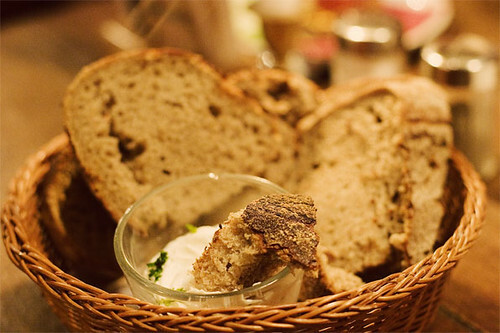 The bread was so fluffy and warm in the inside with a crunchy skin on the outside. They served it with sour cream and oohhhh so good. We ordered 3 salads and I ordered a potato soup, those came to our table within minutes. The 3 salads were tomatoes, beets and cucumber and all 3 especially the beets were soooo good! I never had beets before and after this salad I loooooove them. All 3 salads were simple with just garlic and olive oil. They were fantastic! Fresh fresh fresh. My friend J ordered the Schweinefilet in Champignonrahm, pork filet served on a creamy mushroom sauce with dumpling noodles (they ran out so he got potato dumplings instead) and salad, my friend T got the wiener schnitzel and I got the Königsberger Klopse, braised highly seasoned meatballs served with a light cream caper sauce, boiled potatoes and side-salad. Yes the same meatballs that walked by me. Funny thing all our orders came with a side salad! Oooohhhh so much salad. The side salads also had beets, cucumbers, and tomatoes hahahaha. 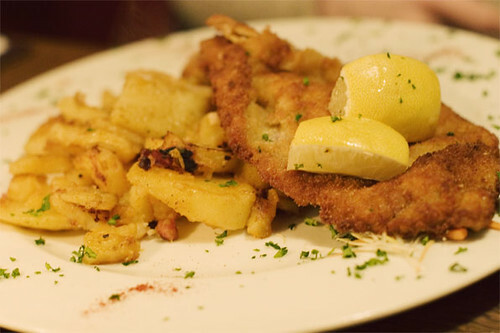 I took a bite of my friend’s wiener schnitzel even though I promised myself not to eat veal. *Shrugs, I didn’t find anything special about it it tasted just like pork katsu and I rather eat pork katsu over a bed of curry rice. Boy was I glad I got the HIGHLY seasoned meatballs. The meatballs were light and juicy, I mean what can go wrong with meat, cream sauce and potatoes?! Nothing! Like everything on the table, it was a simple dish but done so well. Only if we weren’t so dead tired I think we would’ve stayed longer and finished our food. I still recommend this restaurant, just beware of the crazy kitchen staff.